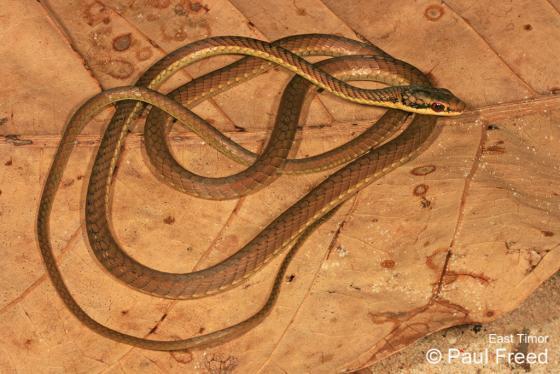 Can you confirm these amateur observations of Dendrelaphis inornatus? inornatus: Sumbawa, Sumba, Sawu, Flores, Lembata, Komodo; Type locality: “Sumba and Savu” [Lesser Sunda Islands, S Indonesia]. Restricted to Sumba fide Meise & Hennig (1932: 287). Types Types: BMNH 1946.1.23.22-25 (and possibly additional specimens). Comment Synonymy partly after STEJNEGER 1933. How R A. Schmitt L H. Maharadatunkamsi. 1996. Geographical variation in the genus Dendrelaphis (Serpentes: Colubridae) within the islands of south-eastern Indonesia. Journal of Zoology 238 (2): 351- 363. Smith, M. A., 1927. Contribution to the herpetology of the Indo-Australian Region. Proc. Zool. Soc. London, 1: 199-225.